While most of the culinary conquests that I write about on this blog consist of restaurant reviews and delightful dishes that other people create, every now and then I do a little cooking myself. I recently spent an afternoon barbequing for some friends where I experimented with some pork shoulder recipes and also threw in a little bit of grilled chicken, green beans, macaroni and cheese, and some homemade biscuits. Brent, Eric, Justin, and James all came over to enjoy the afternoon of sports and smoked meats. Add some beers and few things in life could be much better! I decided to use two different injections for the pork shoulders so I could play around a little bit and see which one came out better. Since my blog is title Bite and Booze, my first decision was that each recipe should contain some kind of booze in it. 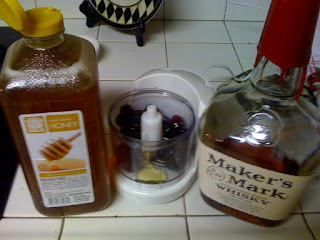 The first injection contained blackberries, honey, and bourbon. I tried to make this one sweet instead of salty to see how the meat would turn out. 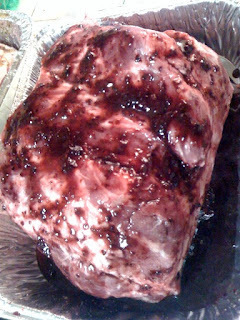 After combining the blackberries, honey, and Maker's Mark bourbon, I injected the liquid mixture into the pork shoulder and then rubbed the rest onto the meat. I let the shoulder marinate like that overnight and in the morning I rubbed it down with a blend of seasoning that mostly contained Slap Ya Mama Cajun Seasoning and brown sugar. For the second shoulder I decided to use more of a salty and spicy mixture to contrast the sweetness of the fruit and honey in the first injection. I blended together some Worcestershire Sauce, Creole mustard, German-style Kölsch beer, and Louisiana-style hot sauce to create a unique injection liquid for the pork. Specifically, I used Lea & Perrins which truly is THE Worcestershire Sauce as far as I'm concerned. For the Creole mustard I used some Zatarain's that I had in my fridge. 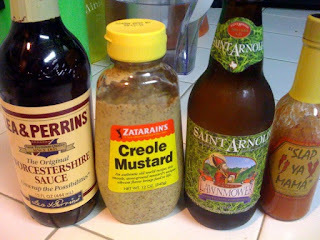 As far as Creole mustards go this is pretty much on the top. My good friends at Slap Ya Mama supplied provided the hot sauce. There a lot of options to choose from when it comes to Louisiana-style hot sauce, but you can never go wrong with Slap Ya Mama! Finally, the beer I chose is actually from Texas, but it is damn good and I have no problem using it with Creole mustard and Louisiana hot sauce. Saint Arnold's Lawnmower is crisp and refreshing with good malt and fruit flavors. I thought it was a good beer to use in this injection because it is full bodied but light enough to not mask the other flavors. Plus, I got to drink the half that did not get injected! Like the first shoulder, I let this one marinate with the injections over night and then I rubbed it down with a generous portion of my blend in the morning. The smoking of the pork shoulders took quite a few hours, so there was plenty of time to enjoy the company of my friends, watch sports on TV, and drink some beers. 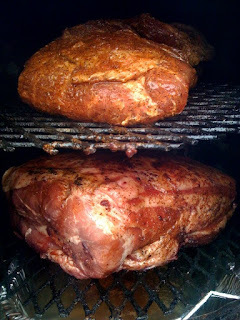 I smoked the shoulders over pure mesquite charcoal. I really like mesquite because it brings me back to my childhood days at South Texas deer camps where my father taught me how to grill on open mesquite fires. Mesquite smoke leaves a unique flavor and spiciness in meats that I've never found from any other wood. While the pork smoked over the indirect heat of blistering mesquite coals, I got to work back in the kitchen to make sure I had lunch ready at a decent hour. I seasoned a batch of chicken thighs with my rub from the pork that mostly consisted of Slap Ya Mama and brown sugar. 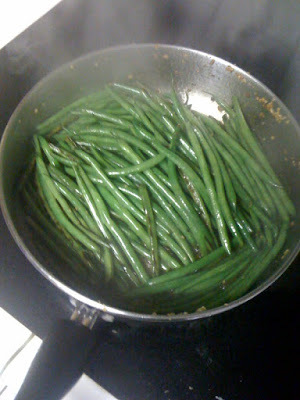 While grilling the chicken thighs over the mesquite, I sautéed some haricot verts in olive oil and lemon juice with a touch of garlic, sea salt, and fresh cracked black pepper. 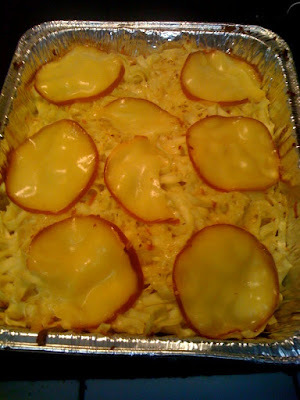 In addition, I made a smoked Gouda mac and cheese with some grated Gouda and boiled egg noodles. I felt a bit adventurous so I took a stab at making some biscuits from scratch. I tried to use a recipe that I had stumbled upon for Popeyes-style biscuits. They ended up having a pretty good flavor but they didn't rise like I wanted and wound up dense rather than fluffy. Oh well, it will give me something to work on for next time! 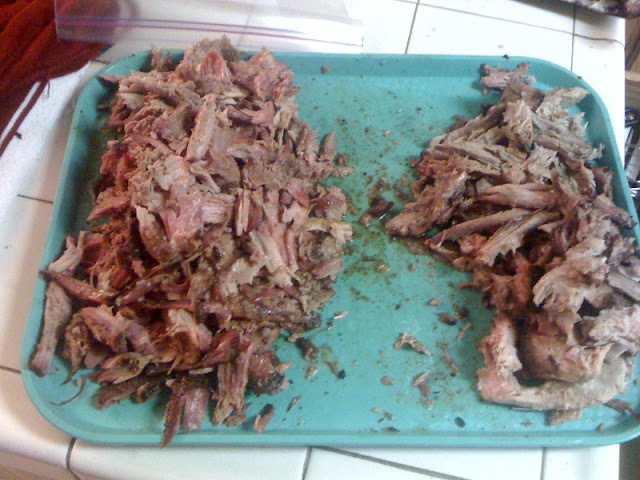 After lunch, football, and several rounds of beers the time had finally come to take the pork shoulders out of the smoker. 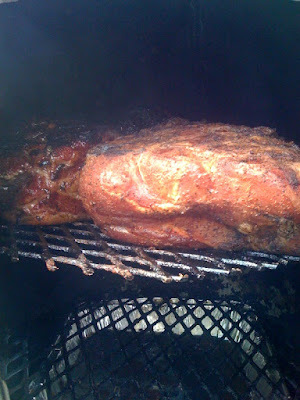 The anticipation in my mind ran wild with thoughts about how great this pork could be. While there certainly are some tweaks to make to the recipes, overall my expectations were met with great satisfaction! The "sweet" recipe could have been sweeter. The honey and blackberry didn't shine through quite as much as I had hoped and I found that I could have used even more sweetness in the injection and rub. Next time I think I will try it with pure maple syrup instead of honey. I also might use some blackberry preserves rather than trying to put fresh blackberries through a food processor. We'll see though. 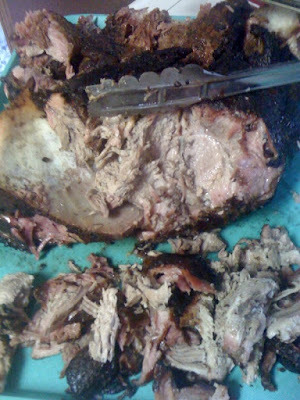 In the end the pork certainly ended up being juicy and tender, I just think it could have used more flavor. I found the salty and spicy shoulder to be the better of the two. The flavor of this shoulder really came through with the spiciness of the mesquite smoke complimenting the Creole mustard and hot sauce. If I had one complaint about this one it would be that I applied too much rub to the outside and it became a little bit over salted if you got a big enough piece of the crust. 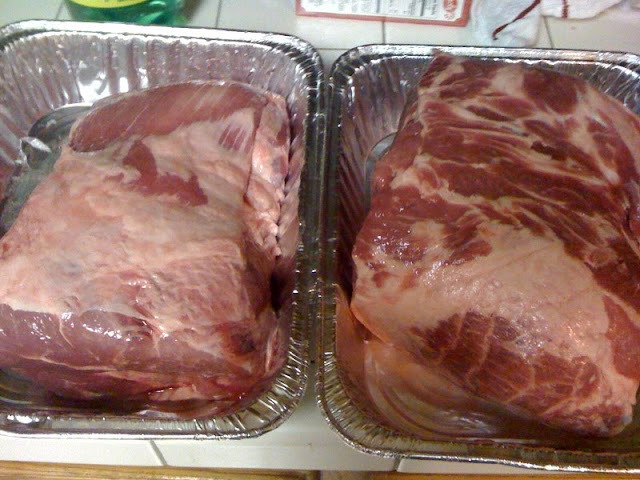 I'll certainly need to work on my rub, though I thought it was really pretty darn good considering how easy it was. 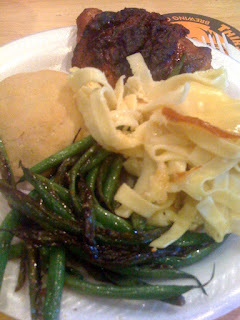 All in all I had some really good food with some great guests while I worked on some barbeque recipes. It is hard to get much better than that! When you let me a tweet asking for my advice, I had know ideas that I was going to be schooled!! LOL I'm taking notes and keeping them to myself! Baste through out cooking and a moisture bath underneath. If you didn't do that already. 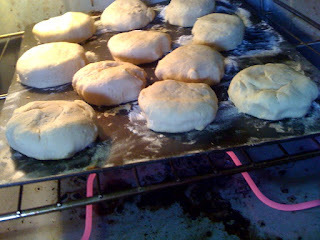 For Popeye's style biscuits, I use Bisquick, sourcream, 7 up, and lots of butter.